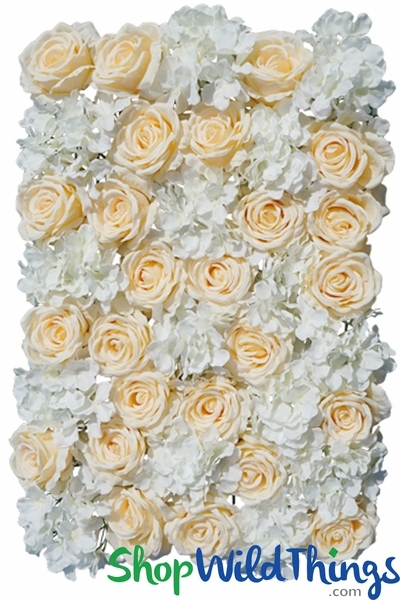 Peach & Ivory Roses & Hydrangeas Flower Wall Panel - Artificial Super-Premium Silk Flower Mat. Easy, snap together frames and add pops of color with sprigs of real or artificial greenery! Ever dream of walking into a flower garden that literally engulfs you in gorgeous flowers? Now you can create your own floral paradise with our durable, bendable Soft Peach and Ivory Silk Flower Rose and Hydrangea Mix Wall Mat and immerse yourself and your guests in tropical floral bliss! *The frame is 15 1/2" by 23" but the flowers extend over the edges making the actual measurement about 20" x 27" and it is 3" deep! This wall is chocked full of a luscious mix of glorious Soft Peach Roses that are 4" in diameter and large clumps of Ivory Hydrangea blooms that are approx. 2 1/2" in diameter. The roses are cupped into green leaves, giving a nice contrast and added texture. This mat only weighs about 1 lb. 3 oz. which allows for many display possibilities. 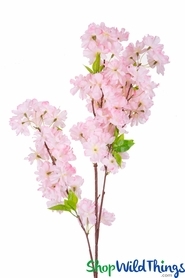 The flowers are attached to a sturdy, plastic grid frame that is completely flexible. Two sides of the frame have plastic pegs which insert into the holes on the other two sides of the frame so you can attach as many mats as you need to cover areas small or large. The flowers extend over the edge of the mat so the grid is pretty well hidden. The mat is so flexible that you can actually attach the mat to itself, creating a circular floral vase! The grids are an inch square which makes it super easy to work with for attaching the frame to another surface. We'd recommend floral wire or wire ties as an extra measure for keeping them secure or simply staple-gun it to a solid surface. 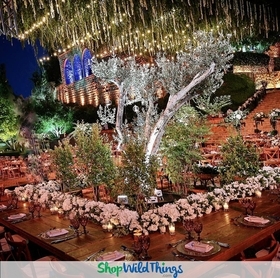 Create breath-taking wedding and event Decor by attaching to a trellis, gazebo or pavilion. 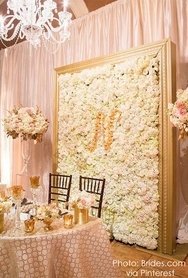 Fashion a stunning wall of flowers and Landscape Wall Greenery behind a head table which can double as an elegant photo backdrop. Use to mask or enhance a column, wall or door and accent with a colorful rose monogram or logo to mark the occasion! If you want to create a design with other materials you can easily part the flowers and use the grid to attach items. 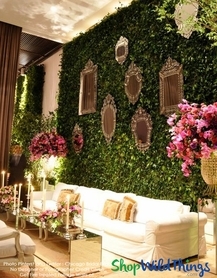 Intertwine fairy string lights or create dimension with your flower wall by intertwining Crystal Beaded Flower Garlands! This mat is an ideal size to use on drop ceilings with metal grids. Create a dreamy floral canopy by suspending the mat with magnet hooks, crystal or pearl strands. Add Sparkling Crystal Strands for added glam. If you need a wall that will be seen from both sides, use the easily accessible grids and tie 2 mats back-to-back. You can even cut the plastic grid frame to make creative shapes.